October 12. 2012. On the way from Schwäbisch Gmund (Baden Württenberg) to Berlin, to take part to the Refugee Protest March Demonstration of October 13, Austine, Charles, Chima, Egbo, Henry and Obinna are target of a police racial profiling control in Hof's Station. 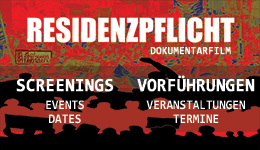 After 10 days a letter from the police charge them with "violation of the spacial restriction" the so-called "Residenzpflicht". From the Refugee Protest Camp the struggle goes on until the abolishment of the german racist asylum laws. "No to the German police racial control and profiling. No to residenflicht law. I will not beg for my freedom of movement. I will not pay for my freedom of movement. I will not stop the fight for freedom and justice." Bleibt in Aktion in Solidarität mit den Flüchtlingscommunitys! - We wish you all the best of the coming years!